Thirtysix persons hailing from Punjab and Haryana, who had gone to Dubai in search of greener pastures, were deported from Dubai on Monday night after they were caught travelling with fake visas. The Chandigarh administration today announced that in the Phase III of the Rajiv Gandhi Chandigarh Technology Park, no land would be allotted to any hotel or shopping mall or for residential use, unlike Phase I and Phase II. The Shiromani Akali Dal (SAD) is all set to shift to a new complex, spread over two acres, in Sector 28. Finishing touches are being given to the new office of the party.Party sources said inauguration of the first phase of the ultra-modern WiFi-enabled office was expected by next month.Once operational, the party leadership will have direct connectivity with its district offices across the state - a facility currently not available in party head offices of either the Congress and the BJP in the city. In an anti-climax, the Congress today decided to withdraw the no- confidence motion against mayor Harjinder Kaur after 75 minutes of discussion. The collective decision of the Congress councillors came after a well-worded speech by union minister Pawan Kumar Bansal. Ending the commotion in the house, the minister said Chandigarh was made Union Territory through the Punjab Reorganization Act of 1966 that was passed by Parliament. The case relating to the recounting of votes from where former president of the municipal council Kulwant Singh was defeated last year was today adjourned till May 8. Counsels for both Kulwant Singh and his opponent Gurnam Bindra Singh presented their arguments in the court. After hearing their arguments, the deputy commissioner finally adjourned the case. Residents of Phase V of the Saini Vihar, Baltana, near here, have virtually been living without amenities. The Chandigarh police and anti-encroachment wing of the municipal corporation removed building material from roads in Attawa late this evening. The Chandigarh administration has come up with a fresh scheme for multiplex theatres and conversion of cinemas into multiplex theatres, replacing the previous policy which lapsed on March 31. UT administrator Gen S.F Rodrigues (retd) today inaugurated closed-circuit television (CCTV) network at the police station, Sector 17. Though belonging to the Sindh province in Pakistan, Sindhis have some similarities in language, faith and customs with Punjabis. Adaptable by nature, the community no doubt has adjusted itself to Chandigarh’s cosmopolitan culture, yet members of the community have maintained their own identity and preserved their cultural traditions. The Indian Army contingent deployed in Lebanon on a peacekeeping mission has provided artificial limbs to over 130 local victims of mine and cluster bomb accidents. The project concluded at Ebel Es Saqi, where the Indian contingent is headquartered, today. Fire broke out in the Industrial Area here today in which a large number of sculptures were destroyed. 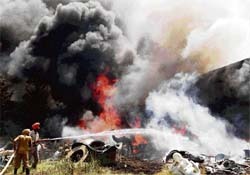 Harvested wheat on several acres of land was destroyed in a fire, apparently caused by a short-circuit, at Togapur village, near here, today. Apropos the news ”Admn to print NCERT books”, I must compliment your reporter for taking up the issue and forcing the authorities to act. The announcement that the administration has taken upon itself the task of printing NCERT books has come as a relief to both parents and their wards. It is even more heartening to know that the authorities will try to get these books published at rates lower than those of the NCERT. Five vehicles, including two cars and a jeep, were reportedly stolen from various parts of the city. 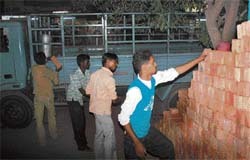 Thieves broke into two houses of the city and decamped with cash and jewelry worth Rs 8.75 lakh. The thefts came to light today when the occupants of both houses returned from their outstation visits. The UT vigilance department today caught a lineman of the Punjab State Electricity Board (PSEB) red-handed while allegedly accepting a bribe for replacing a faulty electricity meter. The Chandigarh Police brought on production warrants a woman from Mumbai on allegations of duping a city resident of Rs 8.50 lakh on the pretext of sending him abroad. Fifty-year-old Gurdial Singh of Sector 27 was run over by an unidentified vehicle late on Monday night. 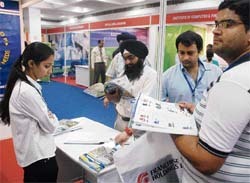 The two-day “Franchise and Retail Opportunities 2007” show ended here today with many national and international brands getting an opportunity to get in touch with local entrepreneurs to have their presence in Chandigarh and Punjab. A senior manager with Oriental Bank of Commerce was allegedly cheated by a book seller. The latter sold the manager a BSNL card, which had already reached its expiry date. Deputy Commissioner R.K. Rao today said the Chandigarh administration had decided to issue a notice to the Confederation of Indian Industry (CII) for misuse of building. A decision in this regard has been taken following a report, confirming the misuse, submitted by a special team of the Estate Office which was sent to inspect the site. For taking leave without getting it sanctioned, one more teacher had to face action by the Chandigarh education department. As many as eight schools have expressed their willingness to accommodate students who got displaced due to the closure of residential schools. The number of candidates appearing for the common entrance test (CET) conducted by Panjab University this year is lesser than the number of candidates who appeared for the test last year. The Punjab and Haryana High Court today ordered a stay on the execution of challans issued to educational institutions of the city for allegedly violating the Cigarette and other Tobacco Products Act-2003. 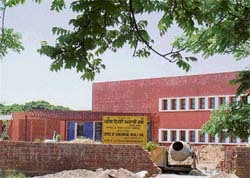 Chandigarh:First semester students of diploma in medical lab technology of Sri Guru Gobind Singh College of Pharmacy, Sector 26, have done their college proud by figuring in the merit list of the final examination conducted by the Punjab State Board of Technical Education in December, 2006. Vikram Singh Taragi stood first while Natasha Vig and Karamjeet Kaur were placed second and third, respectively. Moreover, 17 out of 20 merit positions were grabbed by students of the college. Chandigarh: Saloni Singh of Class X bagged the first prize while Priyanka Kondal and Radhika Sharma, both of Class X, bagged the second and third prizes, respectively, in a poster making competition organised at St Stephen's School, Sector 45-B, here, today. Department of sociology of Panjab University in collaboration with the Indian Association of Social Science Institutions (IASSI), New Delhi, is organising a national conference on “Good governance: Key to human rights protection” at 9.30 am at Golden Jubilee Hall in the university campus, on Friday, April 26. Vice-chancellor of the university Prof R.C. 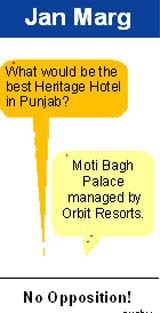 Sobti will inaugurate this conference. Prof Bindeshwar Pathak, chairman and founder, Sulabh International and IASSI, New Delhi, will preside over. The Asian Education Society has set up the region's first exclusive training institute for front line staff and store managers for the retail industry in the city at Shivalik Public School, Sector 41, here, today. D.S. Bedi, principal, Shivalik Public School, Ashwini Luthra, patron, Asian Education Society, and Prof Binay Kumar, CEO, Lingaya's Human and Technological Development Centre (LHTDC), Faridabad, interact with mediapersons at Shivalik School 41, Chandigarh, on Tuesday. The general house meeting of the Punjab and Haryana High Court Bar Association was held yesterday in which various issues related to the bar and lawyers’ welfare were discussed. The Punjab and Haryana High Court today directed the Union of India to produce the draft amendment Bill, related to immoral trafficking, before it following a public interest litigation (PIL) seeking quashing of certain provisions of the Immoral Traffic (Prevention) Act, 1956. The days of three-hour-long matinee show are gone. For, this is the era of short films and features packed with all necessary ingredients of excitement, thrill, storyline, fiction. On the eve of the 34th death anniversary of the legendary Punjabi poet Shiv Kumar Batalvi, the Punjab Sangeet Natak Akademi will be holding a musical concert and a poetry recitation competition of his timeless verses on May 6 next at the Randhawa auditorium. In addition to the present radiotherapy OPD in ‘B’ block of the Nehru Hospital, the PGI has decided to extend the facility to the new OPD building. Chandigarh, April 24 The Bharatiya Jan Shakti Party (BJSP) today filed a complaint with the police against the PGI for alleged negligence leading to the death of Nirmala Singh, wife of Vinay Kumar Singh, general secretary of the party. The Society for the Care of the Blind organised a screening and eye check-up camp at Maloya village here today. Pankaj Kumar of Chandigarh and Sudhir Tanwar of Delhi upset seeded players in their respective boys’ under-14 singles second-round matches in the AITA Championship Series Tennis tournament today. A splendid knock by Harpreet, who scored 52 runs off 28 balls, ably supported by Shunav (42), enabled India ‘A’ team beat T20 CFI XI by 8 wickets in the final of the under-19 Twenty20 Cricket Tournament, which concluded at Cricket Stadium, Sector 16, today. A magnificent century scored by Manan Vohra (110 runs in 213 balls) studded with 14 fours consolidated the position of the Chandigarh team against the Mohali team on the first day of the semifinal of under-15 tournament for the Sushil Bali Trophy. Trials to select the Chandigarh netball team (girls only) for participation in the 11th Federation Netball Championship will be held at Government Model High School, Sector 28, here, on April 26 at 5 pm. The championship has been slated to be held at Mahboob Nagar (Andhra Pradesh) on May 7 and 8. 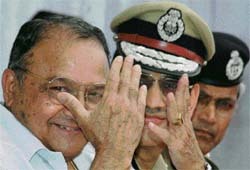 The team will leave for Mehboob Nagar on May 4. A.D. Sharma, a skating coach posted at Panchkula, has been appointed chief coach of the Indian roll ball team for the three-test match series against Pakistan scheduled to be held at Pune from May 1. The Chandigarh administration has achieved Rs 463.26 crore as non-plan surplus, an excess of income over expenditure during the 2006-07, an official press note said here today.